The aim of this thread is for all the evidence and factual information about Toni and his carded figures to be presented in the same place, if anything of importance is missed please let me know so I can update the thread. It would be appreciated if people could post their findings in this thread as opposed to the other one if possible. TOYTONI wrote: Several friends have contacted me regarding a post by a certain Jason Joiner and having read his "story" I feel its necessary to reply. This story is mainly fantasy with a few facts thrown in. As a one time major dealer and expert in Star Wars it is bizarre that after some 25 years Mr Joiner should now come up with this "information" out of the blue! 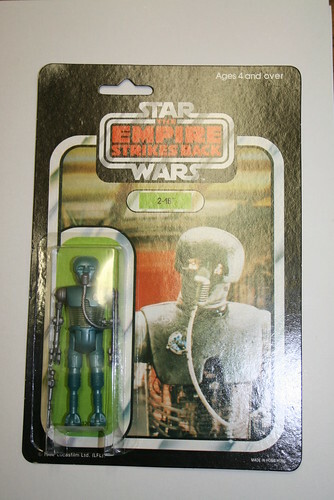 I have been dealing in many different types of vintage toys for over 30 years including Star Wars for about 25 years . Ive been on Ebay since 1998 and have had 2 websites Toytoni and Zoomertoys running for the last 16 years. I have not seen or had any communication with Mr Joiner for the best of 20 years nor have I heard of him making such comments elsewhere. I did indeed buy various toys from a dealer called Arthur in the 80s and early 90s these included tin toys , robots, TV related and carded Star Wars figures. 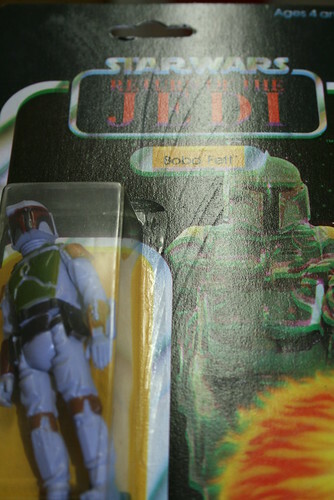 He had a reputation for getting old stock and had good contacts in the regular toy trade. He was one of several dealers that I bought carded Star Wars from. He seemed a nice guy who seemed always short of cash and often offered items which he didn't exactly have but could get his hands on if he could make the sale in advance .So at times it wasn't clear if he actually had the goods or just new a man who had them . I do remember there indeed was a list of items which included unused cards but these never materialised I never saw any or was offered any samples from him . I ended up buying quite large quantities of carded figures from him which were a mix of Kenner ,POTF,Palitoy.,german General Mills and Trilogo non of which came in trade boxes - in those days there wasn't that much interest in carded figures let alone in the outer boxes. The fact that there was this list stirred up some gossip at the time about unused cards but as to whether they existed is unknown. Mr Joiner claims there were many thousands and yet he couldn't get his hands on a single example from this Arthur dealer despite buying 500 carded Hothtroopers ? 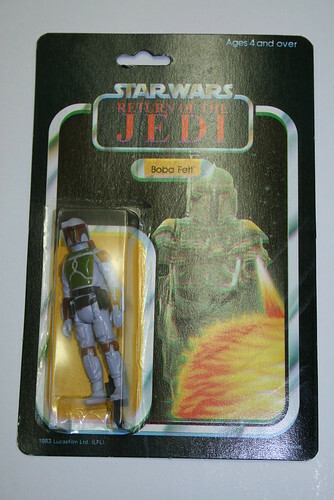 and a staggering 700 carded Fetts?? ?- what utter nonsense !He claims the Fetts were then mysteriously taken off the cards - why would someone cut up 700 carded Fetts - more nonsense- we really are in the realms of fantasy here . 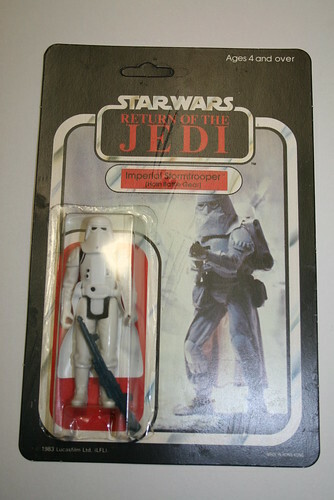 What happened to the 500 carded hothtroopers? Where are these 1000s of factory cards? Mr Joiners assertions that I was claiming I was going to some factory to get bubbles sealed is total fantasy . Arthur on several occasions told me that he thoroughly disliked Mr Joiner ( as did many others- normally mild mannered guys threatening him with physical violence on several occasions at toyfairs ) so its highly unlikely that he exactly would confide in him about the details of what he had, what he kept and who he sold what to who. I suppose it is possible that he had been offered unused cards or even had some but I have completely lost touch with Arthur since he went on to other things and have had no contact with him for over 10 years. I hope this clarifies things if any one has any general questions Im happy to reply but please dont expect me to remember details of exactly who did or said what over 20 years ago!. 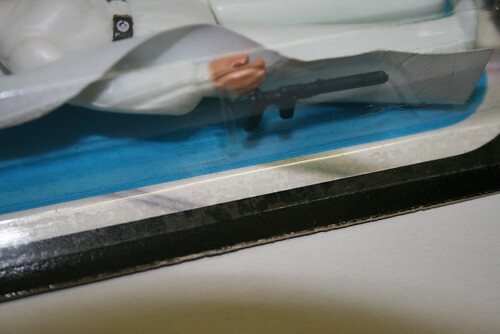 As far as the seal on the General Mills and Palitoys- its generally accepted that most Palitoy Esb and Rotj have smooth seals as do the German issues which were made in the UK . 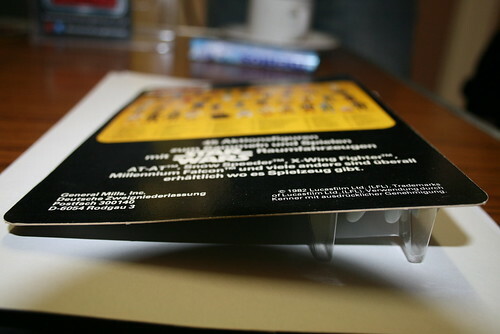 As far as ESB style bubbles on ROTJ cards is concerned this is also not that unusual although rectangular bubbles are the norm ESB style bubbles were used on ROTJ cards both Palitoy/German and Kenner .I hope that clarifies those points . 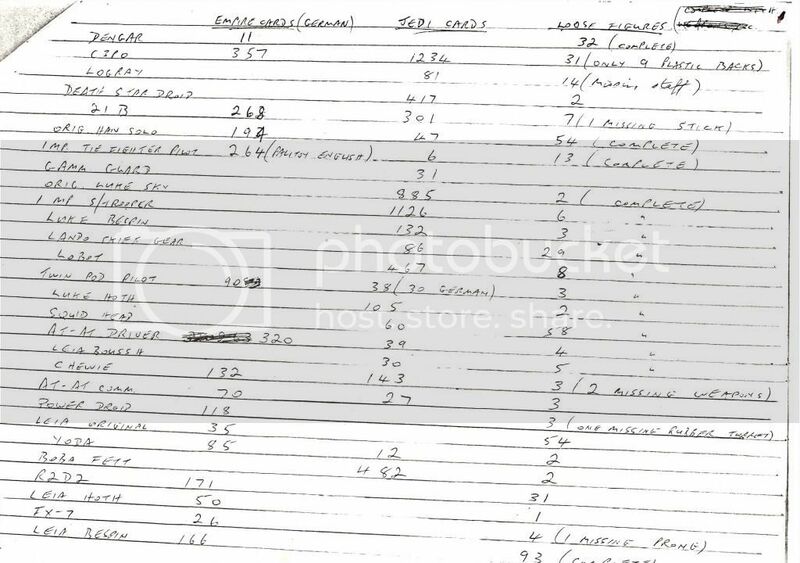 The following is part of the original list Jason Joiner said proved the existence of unused cards/bubbles and figures which was handwritten by Arthur Bailey, the dealer that Toni bought from. TOYTONI wrote: Mr Bailey contacted me with a request for help regarding web development and possible finance as he wanted to devlop a site similar to what is now ABE books but for toys - I had mentioned that I had contacts in web deveopment in a conversation we had had and at the time designing and building webisites was a pretty complex and specialised business. I said I would look into it but I didnt want it having anything to do with my toy business as a sole trader. So he suggested that he could register a company and if anything came of the project it could be run through that-I said OK sent him whatever it was £50 or so signed a form that he sent me and that was it.I made a few preliminary enquiries but nothing came of the idea it was just a name on the company register he may have continued payments to keep the name registered I have no idea .End of story. "hi Jason I got you previous email and I do totally understand you comments .These items are important to collectors and mean a lot to them . I am sorry about what is happening in that community .Basically Im overwhelemed by all this .regards Toni"
While he doesn't deny or admit anything, he does seem to be apologising to the community. It came to light that Toni has an active second ebay account which he uses to purchase mint (sometimes "off the card" mint) figures as well as U graded figures. The ebay ID history shows that Toni's second account name has been changed 30 times. 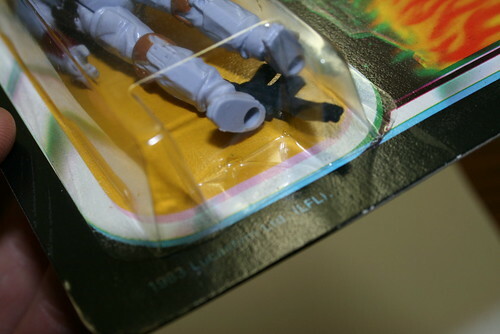 Mattias noted a few flaws on the unused Palitoy backing cards that perfectly match the carded versions sold by Toni. M_Rendahl wrote: Ok, maybe not solid evidence. But for someone who has quite much knowledge in the packaging design and printing-industry, the following facts doesn't speak in ToyToni's favor. This has been know by me for quite some time but I've never compared Toni's moc's and the unused cardbacks with cardbacks/moc's from childhood collections. Let me try to explain. 1. A magenta (pink) dot under the nameplate. This was caused by dirt on the printing plate, which is to 99.9% removed by the printer. And if he misses it, the print batch is likely rejected by the QC department or a few (which could be some hundreds) slips through by mistake. 2. Registration error. One of the printing plates hasn't been placed correctly, which creates a glap in the printing colors. This is also a thing any printer would fix before printing the whole batch. The two things above doesn't show on the childhood cardbacks and moc's Ive seen. 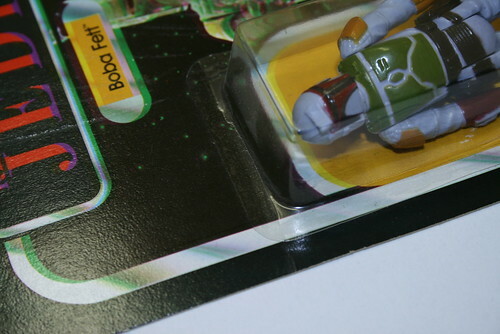 So the unused cardback and moc from ToyToni are from the exact same printing batch. 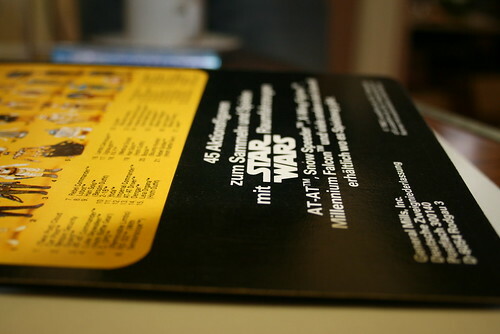 The cardback with price sticker is from a later or corrected print batch. What does this mean? In my world it actually means that the cards with the magenta dot (dirt on the printing plate) and the color registration error was FROM THE SAME STACK OF CARDS, either rejected by the Palitoy QC department or just left overs from the factory when they closed down. And the probability that the unused carcback and the moc from ToyToni just by coincidence have these two defects while others (which don't come from Tonis don't) lacks these defects/mistakes. I have a very busy weekend and wanted to take more time to explain it better, but I thought it was more important to get it out. I'd be happy to answer questions and try to explain some things better if it doesnt make sense. Like I said first in the post, this is not solid proof, but the chances things like this would only happen on the stuff Toni has, are almost none imo. 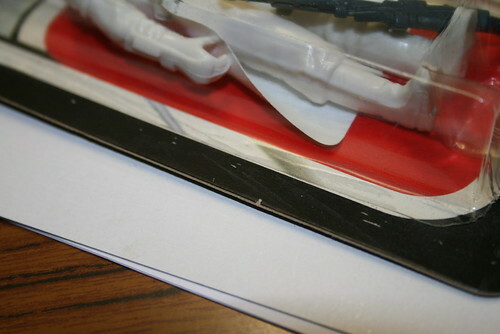 Chris's write up and pictures of the figures Jason Joiner brought to FF4, these are apparently figures that originally came from ToyToni although as of yet that is not confirmed, it does however appear to show that *someone* at some point in time was trying to perfect the process of sealing a bubble to a card. Caswellbot wrote: Hi guys, obviously a lot of folk have been down at the FF4 event today but it seems this thread has been romping on. Today was a busy day at Fordingbridge. It was great to meet up with a lot of collectors and talk all things vintage. Jason Joiner brought along some very interesting carded figures which he says were bought by a collector in Coventry who bought them from Toytoni at a toy fair at Donnington Park. Grant (Maulster) may be able to verify this in time as he is in contact with someone who knows the person who alledgedly bought these from Toni. Hopefully he can confirm whether or not what Jason is saying is verifiable. For now at least, they are proof that someone at some point was definitely trying to seal these cards with limited success. A number of methods have been used of varying qualities. I will try to highlight a few of these methods. There were 17 cards in total and I took photos of nearly all of them. 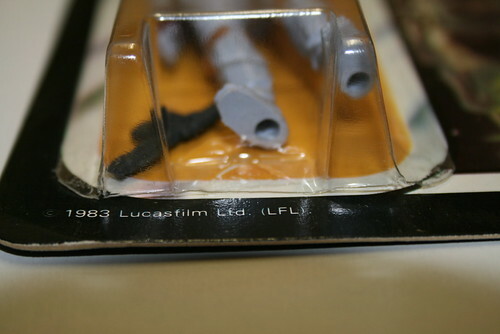 There was also an ESB GM 45 Back Hammerhead which had come clean off the card leaving a bubble (with spray adhesive on it) and a virtually mint cardback which I cant believe I missed photographing although this was 45 min photograph session! I would like to add that of the 17 cards we looked at about 4 looked like they might be ok. The rest were either like frankenstein experiments or near forgeries of the real seal. Spray Mount - Spray Adhesive Method? 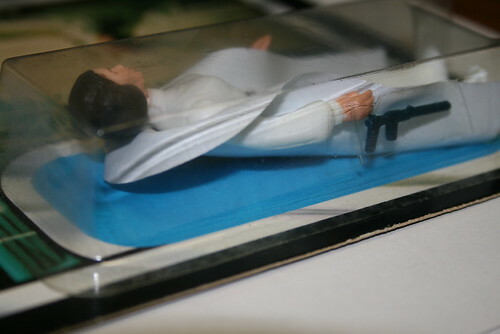 ESB Leia General Mills 45 back (Blue Blaster?) Notice the mottled texture under the seal of the bubble indicating the use of a spray adhesive. The back of the card is perfectly flat. It doesnt look like any pressure/ machine was used to bond the bubble to the card. Iron Method? 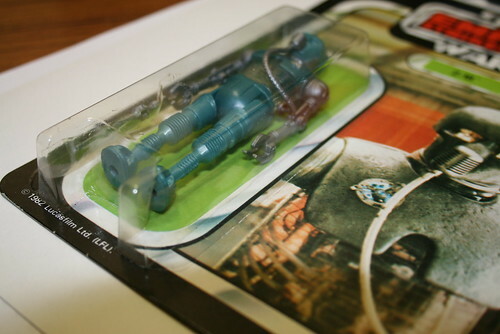 Palitoy ROTJ Pale Blue Fett - Palitoy 65 Back - (Printing alignment error on card.) Note the dragging scuffs of the card which move away from the bubble in an upwards diagonal movement. There is also a triangle shaped indent in between the twin stem of the bubble which gave birth to the idea that this may have been done with a normal household iron. (Diagnosis courtesy of Lee Bullock) The puckering around the bubble also suggests uneven heating. Also Iron Method? 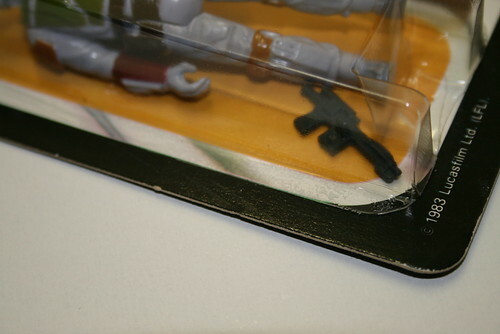 Hoth Trooper Palitoy 65 Back - same scuff marks as the Fett. Malheated bubble. Also check the area around the hanger tab where it looks like there is an indent of another hanger tab where another card was resting on top. V shaped imprint at stem. Brush on Adhesive Method? 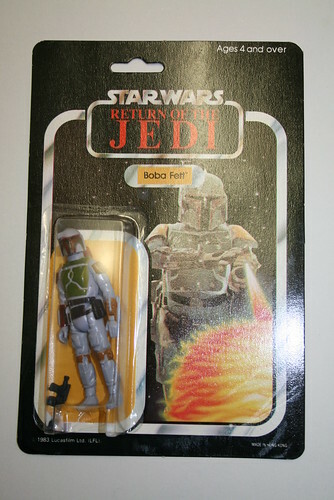 Boba Fett Pale Blue - ROTJ 65 Palitoy Back - The glue looks different on this. It is not speckled/ mottled like the leia and instead looks like it may have been applied with a brush? 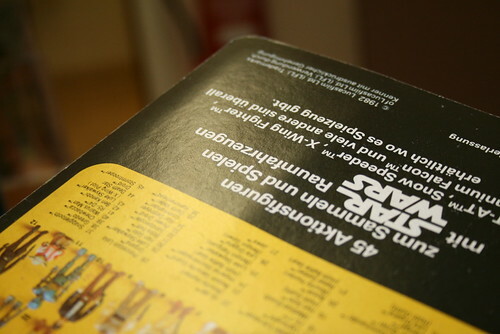 Its a bit of a messy job as there are traces of glue residue smeared around the cardback. Glue couldnt be used to stick the twin stem area at the bottom so again it looks like an iron was used. Dare I say it, this one looked ok? 2-1-B Metallic Version GM 45 Back. Better cleaner seal which looked crystal clear. The black underneath the card actually looked black. 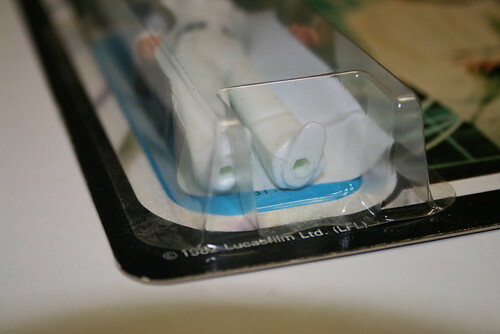 There is also evidence of pressure being applied to the back of the card to seal the card and bubble. Please click on any of the photos to enlarge and see the other photos of all the cards. Here is the result of a previous work i done on the matter. 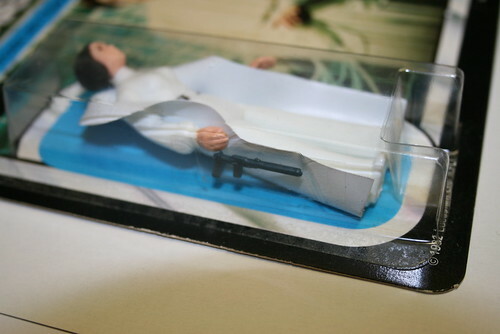 I checked all my ESB MOC and loose ESB cardback(Palitoy, Parker and Clipper) and i think i found the way to descard, at least, one category of Toni's "Mock-Up". 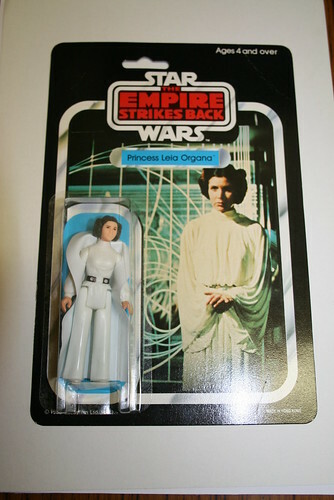 Again, none of my 50+ cardbacks(ESB45bk) with "Single Stem" Bubble has unmarket bubble. It's also the case with my 7 "single Stem" MOC's. That strongly makes me suggest that all unmarked "Single Stem" bubbles are REPRO'S made by Toni. Oli has high res pictures of all of the figures Toni has recently bought on ebay under his second account and is urging anyone who has bought a carded figure from Toni in the last 30 or so days to contact him with pictures. This is super important and may put the issue to bed if a match is found! Although not a perfect indication of how many figures Toni has sold over the years Lee Gray checked the toygrader website to see the amount of Palitoy and GM figures in circulation that have been graded by AFA. in the absence of any other info. I haven't had the time tonight to go back through the entire thread to pull out the important parts so if anyone has the time and feels like helping, please post links or quotes in this thread of stuff you think I have missed or is important enough to be discussed further in this thread. Will put them in the first post. Also - please do use this for discussion on everything to do with Toni's stuff, bubbles, figures, cards etc - I will try to monitor this thread as much as possible so we keep it on track. 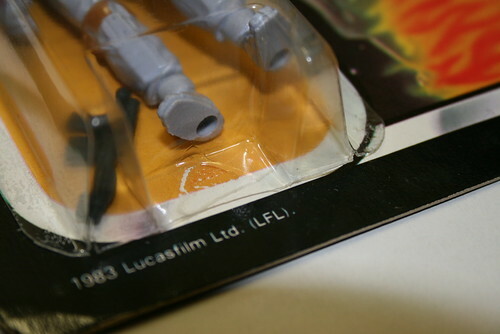 Lee there is no issue with Palitoy SW cards having unnumbered bubbles, as Kenner also only used them after the 41 backs, my Pal 30 and 41 backs are unnumbered so the theory works. 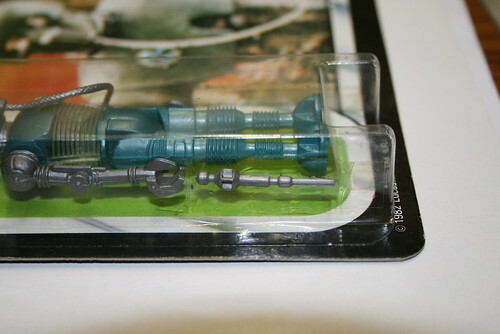 I could be wrong and I don't know if this is the thread for discussion, but I'm pretty certain that Palitoy single stem bubbles have no numbers on them. The 12 and 20 backs I had never did. 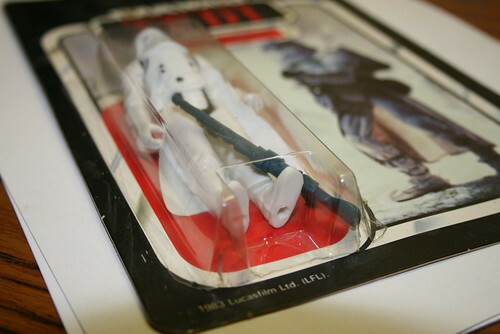 As Spoons said, there's no issue with the previous Palitoy cardbacks. 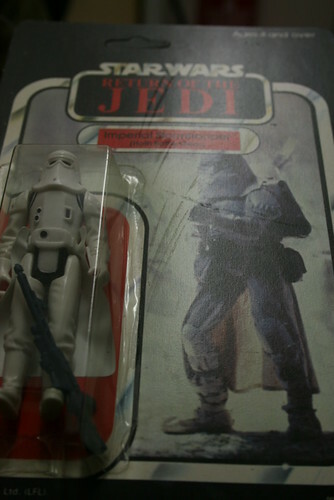 Before the ESB 45 bk "B" (no-logo), all action figures were packaged in the Far-East with their own style of bubble. It's now clear that, at the beginning, Toni had a lot of these original "Single Stem" numbered bubbles. But Toni used them to make seal tests with glue, iron and what ever he used to seal them. Once Toni ran off these bubbles, he made a new batch of them, but this time without marking...and all defects that now appears on these repro bubbles. ...so we can clearly attest that ALL UNMARKED ESB 45 BACK "B" SINGLE STEM BUBBLE ARE TONI's FORGET CARDS WITH A REPRO BUBBLE. ¿Did these TT bubble were made thicker to avoid consenquence of heat in the sealing process??? Thank you Chris, that's good to have other confirmed examples other than mine. 2. Your deatil pics of the "03" show a dimple near the "0"...is that correct? Are these three different cards or the same number pictured three times?? First post on how spotting some of the originals! Thanks guys....I hope I am free to show them here! I watched the Palitoy vid over and over again! Suddenly I had an idea today! I seem to have found out sth. very interesting! I concentrated on the ripped of "only" cardbacks. The used ones with creases, stickers and unpacked! 1. There is PINS holding the cardbacks in place! The bubble all have the same axis (middle/centre) compared to the cards! That means the middle of the bubble always is in the same place regarding the cardbacks! Toni did different....he usually middled the bubbles (at least a bid...not really accurate) to the colored shaped form the figure is placed on. Going through all cardbacks from Mirco and Wolfgang, ALL have the same in comon: The middle/centre axis is nearly in the exact in the same place!!!! (of course some are a tiny bit more left or right). This axis can be spotted well regarding the ESB LOGO. If you check the farest point to the left from the logo were the black border ends (or starts coming from the left) you have your axis! Of course the cardbacks are cut different....so its only a vague hint!!! Again...I could proof this on ALL those cardbacks, no matter which character, bubble type etc! 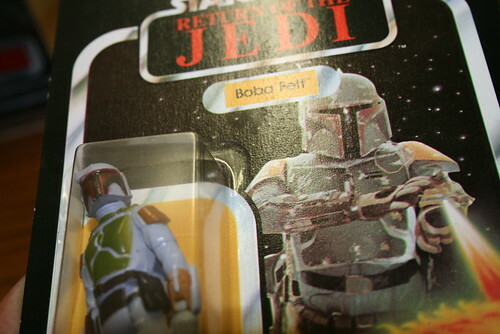 havent much pictures to compare MOCs, but I can already tell you that some Bossks (remeber...there was 1000s on the published list) I have checked are FAR AWAY from this axis! Coincidence?? I dont think so!! The middle/centre axis of all bubbles has the same (nearly) distance to the boarder of the cardback. The fakes are different because they are more middled to the colored background were the figure is placed on! Last edited by wbobafett on Mon Dec 30, 2013 4:34 pm, edited 2 times in total. 1. I asked this question to myself before posting and i have to recognize that i had doubt if it was made before when forming the bubble or made during the seal process.... But, since a lot of "forget" cards appeared with these numbres "smashed" with an iron like tool, there's no doubt they were made with the bubble and not during the sealing. It's clear the person who had these bubbles used them as "Test" sealing till he ran out of them. The number is carved "in" the bubble. If it was made during the seal process, the card would suffered more than it was and the number would appaers also carved in the carback.... and this is not the case. The number just still unsealed and maks the cardback this way. 2. The "03" pictures are from the same figure. The dimple is just an imperfection of the carving... It's a bad example but it was the clearer to show the number.